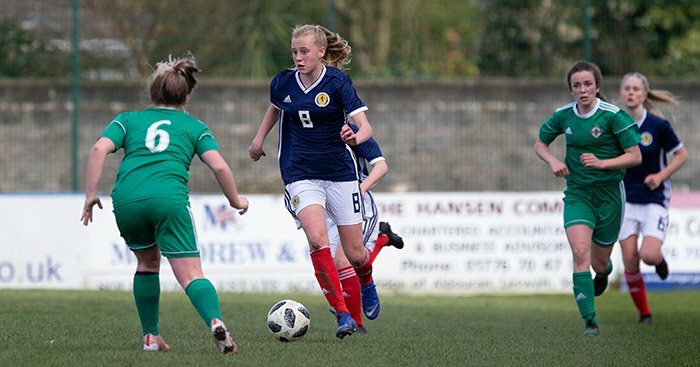 Saturday the 30th of March offered a new squad of Scottish Schools players the opportunity to play in the first International friendly match of this year’s campaign. The venue was Stair Park, the home of Stranraer Football Club. The opponents were a well-prepared Northern Ireland side who had travelled over the water to compete with the young Scots. It is this level of competition that both teams require before they pit their wits against each other in three weeks’ time in Salou in Spain in the Bob Docherty tournament. This first representation is always met with a healthy amount of both nerves and excitement. The Northern Ireland squad had been together for a full year since the teams met in the final game of last years tournament where Scotland had beaten the Irish 3-0 in Belfast. Thirteen of the Irish squad and three of the Scotland team had played on that day. There is no substitute for playing at this level and also having this vast amount of time together would be seen to be advantageous for the Irish team. The Northern Ireland team had also played the Republic of Ireland a fortnight ago, drawing 0-0. With this in mind it was going to be a very good test for the young Scots. The players were met as they emerged from the tunnel to a lovely sunny day and a good expectant crowd. 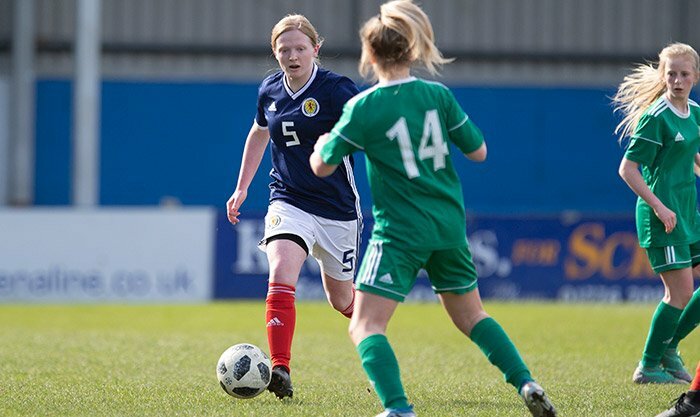 Jess led her team mates out to the cheers of the crowd and then to the sound of Flower of Scotland the squad stood together with a mixture of nerves and butterflies but a desire to do well. Katie took the number one jersey behind a back four of Jess, Rosie, Abbie and Tegan. In front was a midfield four of Addie, Hannah, Kirsty and Maria. Eilidh took the central striker role with Olivia P playing off of her. The game kicked off on the bumpy grass pitch with the early exchanges as was expected both fast and furious as the players attempted to get to grips with this foreign surface for these modern footballers. The back four looked comfortable in the early stages with Abbie and Rosie forming a strong partnership. Jess and Tegan began to tentatively move forward. The teams were cancelling each other out, none more so than in the centre of the field where both Hannah and Kirsty had a fine battle with their Irish counterparts. Kirsty attempted to play positively by pushing and prodding passes primarily to Olivia P who subsequently looked for the powerful running of Eilidh. Eilidh was very unlucky with first meaningful attempt on goal just seeing it diverted past the post. Maria took the subsequent corner but it was well taken by the very competent Irish keeper. The Scots defenders were coping with what the Irish could throw at them and kept them at arm’s length from Katies goal. The best chance of the game at this stage started down the left-hand side when Tegan linked cleverly with Maria. Her pinpoint pass found Eilidh driving into the left-hand channel, she took a lovely soft touch and held the ball up expertly. As Maria caught up with play, she delivered a lovely ball that just eluded Olivia P but found Addie coming in from her flank. The ball just would not sit down for her and although she somehow managed to get a good contact with the ball unfortunately on this occasion the ball just cleared the crossbar. It was encouraging to see the Scots attempting to play the kind of football that had taken them to this stage in their development. In saying this perhaps it was the surface or the lack of competition for some that was to blame for the frustrations that were on show in this stage of the game. Players felt it necessary to take an extra touch or rushed passes where a cool head was called for. However, the next positive action came again from Scotland. Olivia P linked with Hannah playing a neat one-two. She fed the onrushing Jess who delivered a perfectly weighted ball across the six-yard box. Eilidh threw herself at the ball but as it eluded her it fell to Maria who was attacking the back post. Maria met the ball with her right foot and although she had made the run off of her opponent, she did not make the full contact that she would have liked, giving the keeper the opportunity to claw the ball away making another important save. The Scots pushed again and forced another corner but again the conviction to attack the ball in the opposition box was not enough and the keeper along with her centre back dealt with any problems that the Scots set them. The Scots kept plugging away, pushing and looking for openings, but it was the Irish who made the breakthrough to change the score line. The ball was played around the centre of the park and after a series of short passes the ball was played into the Scots box. The ball appeared to be harmless enough as it cleared Jess’s head. Unfortunately, she did not get a call as the left midfield player reached the ball before Jess. The young defender ushered the Irish player away from goal. However, in her determination to make amends she inadvertently clipped the attacking player and she went over. Soft it maybe but a penalty was given. International football can be cruel. Katie stood tall and was very unlucky not to get a hand to the penalty as it was placed to her left-hand side. Their play had not merited this hammer blow and it was a position that they had not been in in any of the previous games. They needed to regroup and step up as the realisation of football at this level was there for all to see. The players did not have time to feel sorry for themselves and as the game started to ebb and flow again. The Scots made the first of the changes as the Irish were given a free kick on the half way line. Niamh N and Keira, who had come into the fray and quickly took up the reigns on the left-hand side with Maria pushing into the centre of the park. The two young players linked up well but, on this occasion, the final cross just fell short of the front post and its intended target of Eilidh. The referee blew for half time and the Scots went in feeling that they had started well but realising that International football has to be played with the head just as much as with the ball at your feet. The teams re-emerged with another couple of changes with Olivia K and Aimee coming into the game. It was also good to see London getting into good positions and linking with the players around her. The purpose of these friendly challenge matches at this stage of the campaign is to let all of the squad sample International football. It lets them play at this new level for most and to see what will they expect for three days at tournament level in April in Spain. The second period started as it had finished with the Scots chasing a goal. The next goal was going to be very important in the context of the game. Rosie was now taking the game to the Irish as she drove purposely into midfield attempting to drag her team mates with her but, the final pass or the final cross when the Scots got into good positions were either wasted or petered out with the ball going behind the goal. Elvie also came onto the park and attempted to drive the team forward to get something from the game. As the game was playing out it was Maria who took it upon herself to get a goal back and as the keeper was off her line she shot for goal. 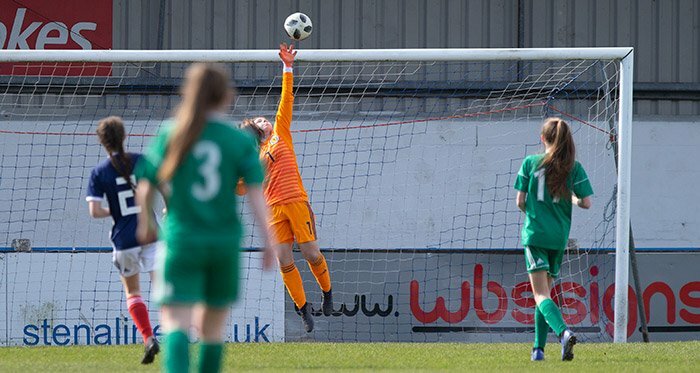 As the ball bounced over the keeper it appeared that a goal was on the cards but unfortunately on this occasion the ball not only cleared the keeper it also cleared the crossbar. Aimee and Olivia K then linked expertly for another chance. Olivia played the ball from her wide berth to Aimee who held onto the ball with her back to goal. Olivia made the run inside her defender and took the ball in her stride as Aimee laid it into her path. As she looked up, she attempted to play it into Keira but it was just played with too much pace and the ball shot across the face of goal. It was the Irish who were feeling more confident as the game went on as it looked for all intent and purposes that it was not going to be the Scots day. 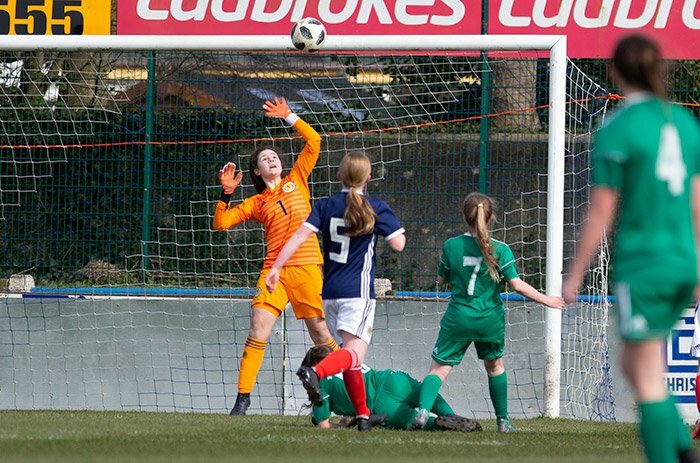 With Niamh M coming onto the park and taking over from Katie in the Scots goal, it meant that all eighteen players would now be full International players, following in the footsteps of the very best that the Scottish national team has on offer at this years World Cup Finals. A very proud occasion for all of the parents, family and friends who have watched these young players develop over the years. The Scots had huffed and puffed in stages of the game but had played for the majority of it in the Irish half and with the ball. It was very much a learning experience for the Scots, who will all learn and take stock of their own individual play and responsibilities in and out of possession. The squad collectively have a full three weeks to refocus and take all the positives, the smiles and the enjoyment of playing football together into the Bob Docherty tournament to the Cambulis Park complex in Salou where they play Wales and Northern Ireland again where they will believe that with a little luck and hard graft and guile, they will be able to overturn todays result.